UberConference is about simplicity. So when you invite someone to a conference call, we make sure they get notified either by email or by text. Although this works great for the vast majority of your contacts, there are a few technology lovers out there with more than one or two phone numbers (our very own Craig Walker comes to mind :-). In such cases, you may not want them to be notified about the same conference call on all of their phones. 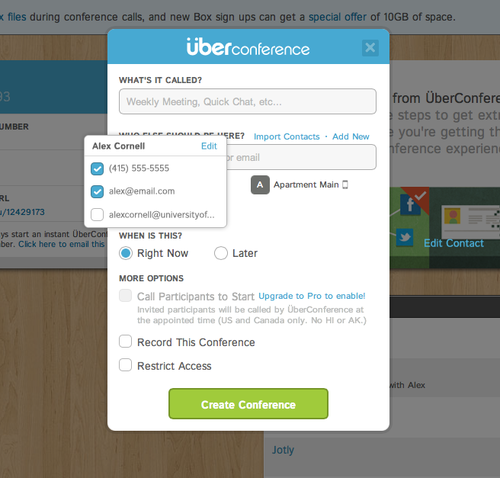 Starting today, when you schedule a call on UberConference, you can mouse over the attendees that you invite and see the option to select which of them you want to receive notifications and to which phones and email addresses if they have several. This choice is sticky, so we will remember it for you for future invitations. Hope you like it. As usual, we would love to hear your feedback if you have any.